When New Horizons spacecraft passed Pluto on 14 July, is equipped with an infrared camera as part of the Linear Etalon Imaging Spectral Array (LEISA). LEISA is a spectrometer on New Horizons’ Ralph instrument, that operates in 256 near infrared (NIR) wavelengths between 1.25-2.50 micrometers. The Ralph instrument combines visible imagery from the Multispectral Visible Imaging Camera (MVIC) with infrared spectroscopy from LEISA. A little background: Spectroscopy, the measurement of radiation intensity as a function of wavelength, is used in physical and analytical chemistry because atoms and molecules have unique spectra or ‘code’. The measured spectra are used to determine the chemical composition and physical properties of astronomical objects. LEISA uses infrared spectroscopy using an infrared camera detector or spectrometer, to capture the longer invisible infrared wavelengths of near infrared NIR (vs. sometimes using shorter wavelengths of optical light) and in this case using multi-band infrared sub-wavelengths to derive the chemical composition ‘code’ of a distant celestial body. The above map represents just three of those 256 NIR wavelengths, as more data has yet to be beamed back to Earth, in a slow process that will last through 2016. The bright blue, red, black, and green pixels — overlaid on a LORRI basemap, represent methane ice accumulations as derived from infrared spectroscopy. Three colors on the map represent the three wavelengths data transmitted to date. The color red was chosen to map the longest infrared wavelength thus far (2.30 to 2.33 micrometers), followed by green (1.97 to 2.05 micrometers), and blue at the short end of infrared (1.62 to 1.70 micrometers). 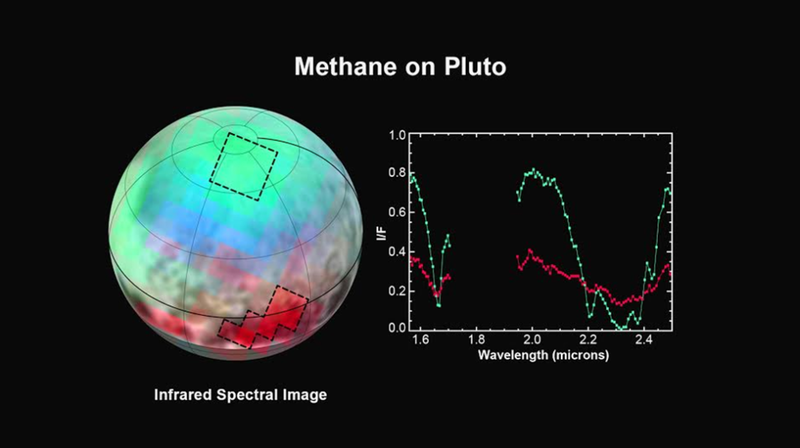 From what scientists are observing from the Ralph instrument, Pluto is abundant in methane ice, but it is unevenly distributed, for which they lack understanding. Methane changes from gas to liquid to ice as the temperature drops. On relatively warm Earth methane takes form of a gas, on Saturn’s moon Titan methane is a liquid sea, and on distant and very cold Pluto, methane has become thick mountainous patches of ice. Pluto’s equatorial patches are so reddish-brown dark in optical light they have shallow infrared absorption. But in the north polar cap, methane ice is diluted in a thick, transparent slab of nitrogen ice resulting in strong absorption of infrared light. For the first time in history we have images near Pluto. Pluto has come as a surprise with it’s giant heart shape on the surface, its reddish color like Mars but for a different reason, the fact it could be geologically active to this day which is a mystery why, incredible mountain ranges and glaciers that look surprisingly like Earth’s, its strange snake skin like terrain shaped by its alien hydrological glacial cycle (it snows nitrogen), Pluto’s daily weather changes, and a 12 layer nitrogen/methane atmosphere. A different instrument, Alice, will beam back separate data about Pluto’s atmosphere. Not too long ago, all that was known about Pluto was represented by a distant blue dot. Bottom line: Pluto’s ice is more diverse than anticipated to say the least. Note: Spectroscopic studies were central to the development of quantum mechanics and included Max Planck’s explanation of blackbody radiation, Albert Einstein’s explanation of the photoelectric effect and Niels Bohr’s explanation of atomic structure and spectra. I like this post, enjoyed this 1 appreciate it for posting. Pluto is now my favorite. Who would have known it was going to be a real gem of a rock! Can’t wait until more and more data is transmitted back. Hello! I like your writing very much! Maybe you should host a chat on AOL? I need a specialist on this subject to unravel my problem. We stumbled over here by a different website and thought I might check things out. I like what I see so now i am following you. Look forward to looking at your web page repeatedly. Hi I am Kristy, it’s my first time commenting anywhere, when I read this article I thought I could also create comment due to this good article. Thanks for giving me further understanding for New Horizons instruments, I understand better when I read other articles about Pluto. There are so many good sites talking about Pluto, like this one. So much is being learned in so little time. I like your Facebook posts relating to this. Millions of kilometers in space. Think about it. It’s not quite parsecs, but still. Think about it. Ah Pluto, the little hummingbird of the Solar System. Hello! Someone in my Facebook shared this site with us so I came to take a look. I’m definitely enjoying the information. I’m bookmarking and will be tweeting this to my followers! Great blog and wonderful design. Thanks for your blogroll, they are really interesting links to visit as well. Usually you post some extremely intriguing stuff like this. If new to reading this site keep reading! I just want to say I am beginner to blogging and site-building and definitely savored this web site. Very likely I’m want to bookmark your site . You amazingly have excellent writings. Thanks for sharing with us your webpage. My compliments to this post. Right here is a great deal of knowledge. Wish I found this site sooner. I’ve been surfing online more than three hours today, yet I never found any interesting article like yours. In my opinion, if all webmasters and bloggers made good content as you did, the net will be a lot more useful than ever before. I couldn’t refrain from commenting. I came across this cool internet site and simply want to let you know. Write me back should you want. I’m looking for the articles that make an impact like these. Thank you. Spot on with this write-up, I really think this amazing site needs a great deal more attention. I’ll be back again to read more, thanks for the information! Wow, fantastic article. All the pertinent details are tied together. Keep up the good work! Simply wish to say your article is as surprising. The clarity in your post is just excellent and I can assume you are an expert on this subject. Well with your permission allow me to grab your RSS feed to keep updated with forthcoming post. Thanks a million and please continue the enjoyable work.